The Cube of Space is a concept first introduced by the American occultist Paul Foster Case (1884-1954). Case wrote numerous lessons for the Builders of the Adytum (BOTA), a school of the Western mystery tradition with roots in both the Masonic Blue Lodge system and the Hermetic Order of the Golden Dawn. Like the Hermetic Order of the Golden Dawn, BOTA teaches the Hermetic Qabalah, Tarot, Astrology and meditation. In his lifetime, Paul Foster Case published several works including The True and Invisible Rosicrucian Order, The Book of Tokens, The Name of Names, and an impressive number of books on the Tarot. Besides his development of the Cube of Space, he has also contributed to the esoteric study of musical pitch and color. The cube, particularly Metatron’s Cube, is a complex figure full of sacred geometric shapes. Sacred geometry is the study of finding universal patterns in everything from music to cosmology. The Five Platonic Solids, for instance, are all found in Metatron’s Cube. 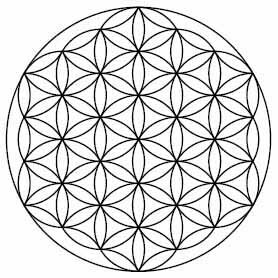 In a two-dimensional display, the Cube overlaps with the Flower of Life, a significant pattern found throughout history in various civilizations. It is theorized that the Qabalistic Tree of Life is derived from the Flower of life. The attributions in the Cube of Space are based upon the three categories of Hebrew letters from the Sepher Yetzirah, one of the earliest books on Jewish esotericism. These three categories are the mother letters, single letters, and double letters. A verse in chapter four of the book associates the six double letters with the six cardinal directions and in chapter five, the twelve single letters are associated with the twelve directional boundaries, or edges of the Cube. Further, the twelve single letters may be said to represent the signs of the Zodiac, and similarly, the double letters symbolize the planets. The directions inside the Cube represent centers of emotional consciousness, which leave imprints on our mind processes. These processes include emotions, experience, and symbolic thinking. Essentially, the Cube of Space allows a way to access and store our experience in three dimensions so that we may better understand our own personal narratives. With the Cube of Space, we can map our life’s journey.
. . . And so on. Used in conjunction with the Cube of Space, the Tarot can serve as clues directly into your psychological space. By examining the relationship of the card in the Cube with the card you pull, you can find new ways of deepening your understanding of these archetypes in your life.